As a tournament badminton player and coach with 40 years of experience working with all levels of ability from beginners to high school and collegiate champions, U.S. national team and Olympic badminton players, it is a joy to serve as the director and club pro for the AZBC. Before discovering tournament badminton at Arizona State University (1978-1980) and later serving as the head coach for the ASU Men's & Women's Badminton teams (1988-1993), I was a 3-sport varsity athlete in high school with collegiate scholarship offers in baseball, tennis, and soccer. This also helped shape my overall experience and understanding of what it takes to succeed in athletics. I have benefited from many outstanding coaches and have suffered from a few poor coaching styles as well. Bottom line: there is no substitute for hard work, consistency and dedication. There are many principles of training and skill development that are proven. I identify four primary areas for training: FITNESS, SKILL, STRATEGY, and FOCUS. Fitness and Skill are the foundation, including the development of cardiovascular conditioning, footwork speed, agility and efficiency, shot-making form, accuracy and consistency. Strategy and Focus build on that foundation to maximize your success. Focus is the ability to think clearly without distraction and be ready while in the heat of competition. I like to call it "locking in." Everybody can show remarkable improvement and greatly enhance their playing experience with good training in each of these areas. We are developing a culture where all players and coaches at the AZBC work together as a team to help all of us succeed. This team approach avoids the "jealous" coaching style that takes ownership of players as their own and can cause rifts between coaches and players. No paid coaching at the AZBC will be allowed without advance written application and approval by the Club Pro. I am really looking forward to being a part of the community of badminton players at the AZBC with the mutual pursuit for fitness and badminton excellence regardless of whether you are a young kid, high school player, mom or dad, senior, recreational player or international badminton star! NEW! Sports Science at the AZBC! I am very excited to report new explorations in the area of Sports Science at the AZBC. Badminton offers great opportunities for research into the speed, fitness and various other measures of the athletic parameters of our sport. This research can help further develop our coaching, broadcasting and even public promotions of the game. We have quality resources immediately available with Arizona State University nearby as well as many AZBC members with credentials in high-tech fields. For example, AZBC member Cedric Hurth, PhD has access to high speed cameras. We asked the question: "Why do we make so many mistakes trying to hit put-aways at the net?" In an initial experiment Cedric set up a high-speed camera on one of our courts and we shot video of dozens of hand-tossed net shots. Even these initial results give us a better understanding of what takes place between a bird and a racket at the net. Based on our initial results my explanation is that we make a disproportional number of mistakes at the net because the bird is moving at many different speeds, spinning rates and angles, and accordingly at inconsistent angles of approach to the racket. Sometimes the bird may be up-side-down, sometimes sideways, etc. at the point of contact with the racket. The rebound off the racket then varies with the angle of contact between the bird and racket, with even slight differences changing the rebound angle. This is compounded, because sometimes the cork is struck and other times the feathers are struck. Because we cannot (easily) see the different angles the bird is approaching the racket, the rebound angle varies more and is less predictable than at other locations on the court, thus we will make more mistakes at the net than expected. We have other Sports Science projects in the works and will report on them as the results come in. Get more info at the AZBC PRO SHOP or by email, contact Guy Chadwick at GCoachGC5@cox.net. 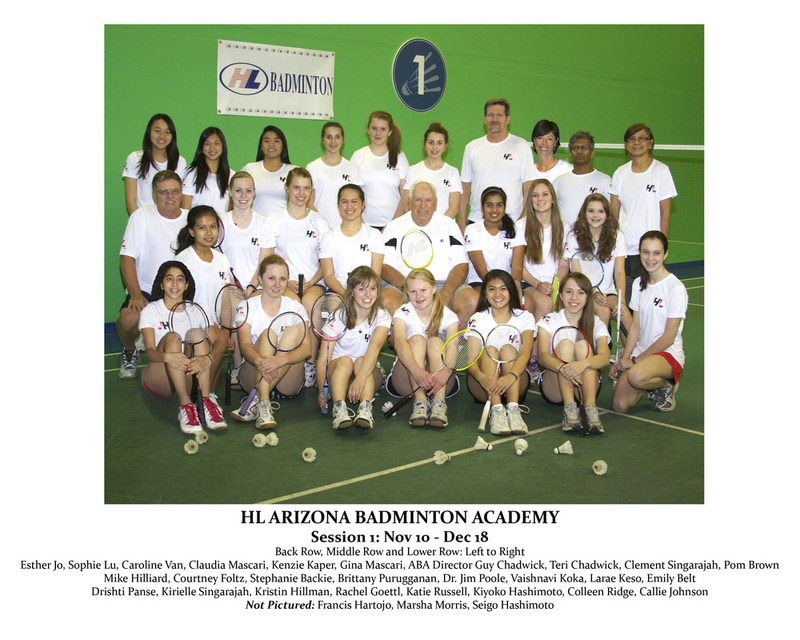 NOTICE: We are in season #7 of the HL Arizona Badminton Academy which have sessions that run from November - December, January - February, March - April. Each session runs for 5-8 weeks, 2 days a week, 2 hours per practice. We will have registration information available about one month prior to each next session's start. 2) Open Play continues 7 days a week for players of all ages. Visitor and Membership rates apply. 2) KIDS CLASSES at the AZBC Mondays & Wednesdays-- 6pm-7pm (beginners, age 5-13) $10 or $75 for a 10-class card! 3) Private and Small Group lessons are also available throughout the week. As outlined on the Membership Rates page, there are two primary categories of AZBC memberships: Individual and Family Memberships. Private and Small Group Lessons are available to all members and guests. Cancellations without 24-hour advance notice will be paid in full.